You must make reservations at least 5 minutes in advance of the time at Wasabi Hibachi Steak House. Monday – Thursday: Lunch: 11:00 a.m – 2:30 p.m. Dinner: 4:30 p.m. – 9:30 p.m. Friday: Lunch: 11:00 a.m. – 2:30 p.m. Dinner: 4:30 p.m. – 10:30 p.m. Saturday: Dinner: 12:00 p.m. – 10:30 p.m. Sunday: 12:00 p.m. – 9:30 p.m.
Wasabi, located in Novi, Michigan, serves Japanese cuisine in a modern, sleek atmosphere. 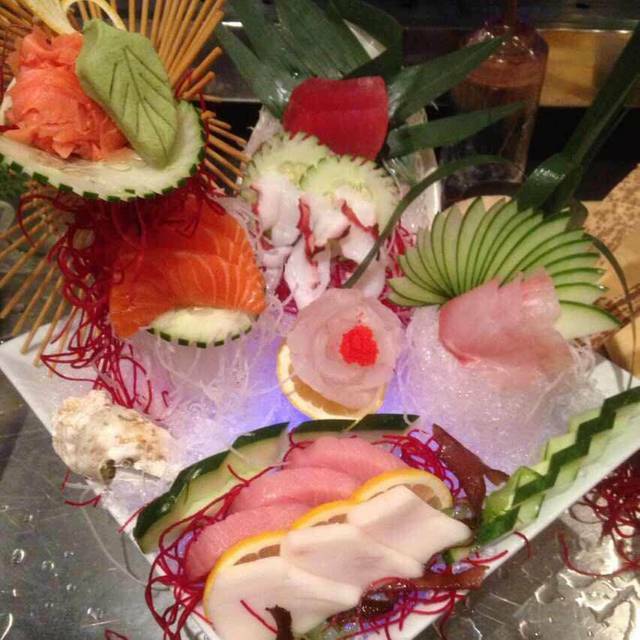 The menu includes over 30 different varieties of handmade sushi rolls as well as dishes that are prepared at tabletop grills right in front of you. Wasabi has a full bar which features sake, wine, beer and spirits. Start out with a soup and salad at Wasabi or order an appetizer to share such as the edamame. 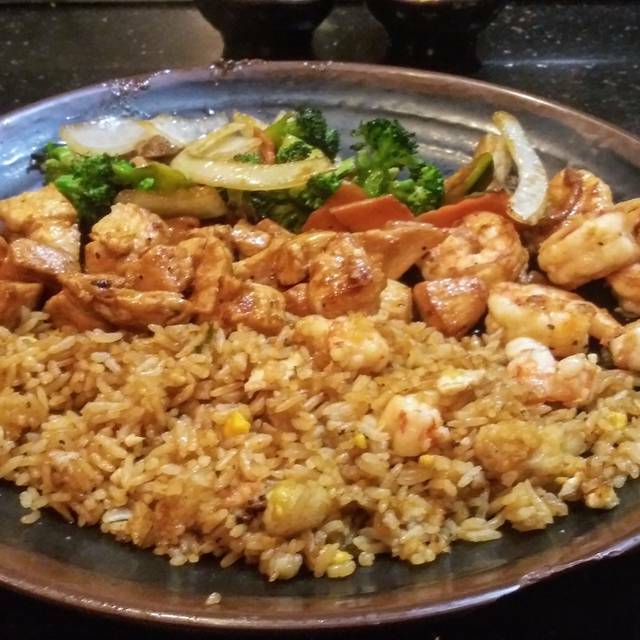 Try the California roll or order the steak and scallops teppanyaki meal. In addition to its full-service dining room, the restaurant offers seating at the sushi bar and takeout services. Chef didnt speak English, food was very salty, chicken over cooked, noodles were cold and greasy. Very disappointing and expensive! Fun place. More reasonably priced than their competitors. Everything was very good. The food was delicious and our cook was entertaining. Server was also good, but a little slow, but to be fair, he did get one of our party that was late, right up to speed with the rest of us, so I guess he should also be a 5 star. Lots of fun. Went out for a nice dinner with my wife and son and got a very mediocre experience. Our waiter was nonexistent forgot to serve the soup and brought us very watery salad. We had to ask a number of times for refills on our drinks. The chef was better but very hard to understand and felt like he was just going through a routine not creating a dining experience. I would not go back to many other places deliver a much better value and entertainment. The only complaint our group had was waiting an additional half hour from our reservation time. the food and service were outstanding. The server we had acted as if she hated her job. A fake smile can go a long way especially when you’re unsure of what you’re doing. The chef was great and friendly. I went there two days in row because my son likes it and he was in town from college. Both times had same waitress. She was rude, unhappy and couldn’t speak much English. Terrible service by her! Told you all and you did NOTHING. They did not have our reservation when our party arrived. It is normally busy on a Saturday night and thankfully it was not on this night and they were still able to seat us. It would have been a problem for our party of 10 to find another restaurant to eat at. Some of our party arrived up to 25 min early and planned to get a drink at the bar. There was no staff at the bar and by the time we were seated, they still hadn't gotten a drink. The food is always good, but it's the service that is lacking here. The food was fine. The filet was actually very good. But the service is always terrible. Super slow wait staff and waiting for a chef. No one is ever there so it’s not because it’s busy. And the chef doesn’t really make any effort to put on a “show”. He is just cooking in front of you. The food was good, as usual. This was not my first visit there but it was my second time using opentable to reserve a table. Both times, Wasabi indicated that they didn’t get the reservation. The first time was NYE so I figured that was the problem. The second time was a random Sunday. When we arrived the hostess told me that I should have called in addition my open table reservation. She did not apologize or express any concern over the fact that they basically don’t get their open table reservations. She acknowledged that this is an ongoing issue. Basically, don’t bother reserving with open table at this restaurant . Once we were seated, we waited over an hour for our cook to come and begin our food. That was the longest I have ever waited there. The table next to us, which was seated 30 min after us, was served before we were. We were later told they were short staffed that day. Overall, this was my worst experiences at Wasabi. Usually it is not so negative. I think we will try a different Hibachi next time. Always a fun time at Wasabi. Our chef was great. The waitress had some trouble understanding English, but things turned out fine. The chef puts on a fun show....food is delicious...great service! Service was horrible! My reservation was at 7:00pm, I didn’t get seated until 8:00pm. The food was absolutely disgusting. Additionally, the establishment was extremely dirty. They were clearly busier than they expected, but we weren't seated until over 30 minutes past our reservations. Our order wasn't taken for another 30 minutes after that, and we had to yell to the wait staff to try to get a drink. They didn't start cooking our meal for at least an hour and a half after we got there. They were out of tp in the rest room. I had to interrupt a wait staff talking to a friend at the bar, and she gave me 3 napkins!?!? Usually have a good experience. Very disappointed. such a pleasant experience and would recommend the food for sure!! We had an amazing time! Awesome food and our chef was the best we ever have had! He made our birthdays extra special! I am not able to rate Wasabi because I was allowed to reserve a time during which the Restaurant was closed, they are closed Daily between 2:30 and 4:30P, why doesnt Open Table know this???!!! Great food and service! I've been there several times and plan to go back several more! Very poor service. Waited to be seated for 17 minutes. Hibachi grill was not started until after an hour of waiting for another random 4-some to fill the table. Drinks were slow and poorly made. Hibachi chef did not want to be there and I have never had anyone that boring. Parking was easy as there was almost no one there on a Friday night. More than half of the grills were empty. Food was "good," but I have had much better scallops and filet, and my wife's shrimp tasted unseasoned. Kitchen forgot to make my daughter's vegetarian noodles, so we got that for free. Could not flag down a waiter, and when we were able to get the attention of another waiter, the message was lost. Manager no where to be seen. I have eaten here several times before, about a year ago, and had a great experience. Something drastic has changed at this steakhouse and will not be going back. Great food...chef put on a fun and interactive show. Met some nice people at our hibachi table and even made friends with one of the couple's!! We made reservations 3 weeks prior to Christmas Eve. When we walked in the lobby was full of people waiting. Everyone had reservations but the restaurant was already full. They just sat all of the tables and nobody had their food yet. When asked about it, the host giggled and said 1 1/2 hour wait. No announcement was made and the bartender wasn’t even at the bar. Terrible management. We left and went to Genji (Japanese steak house in Novi). 15 minute wait and the food and service was excellent! We will never go back to Wasabi. We left the restaurant after an hour of not being greeted by any waitstaff. This was after being seated 20 minutes late. Will not return. Our group of 5 shared a hibachi table with a group of 4. Our waitress never brought our drinks, although we did get water. Our chef may as well have been in the back kitchen. I don't think he even told us his name. Two of us have celiac disease and had to have our orders made in back. 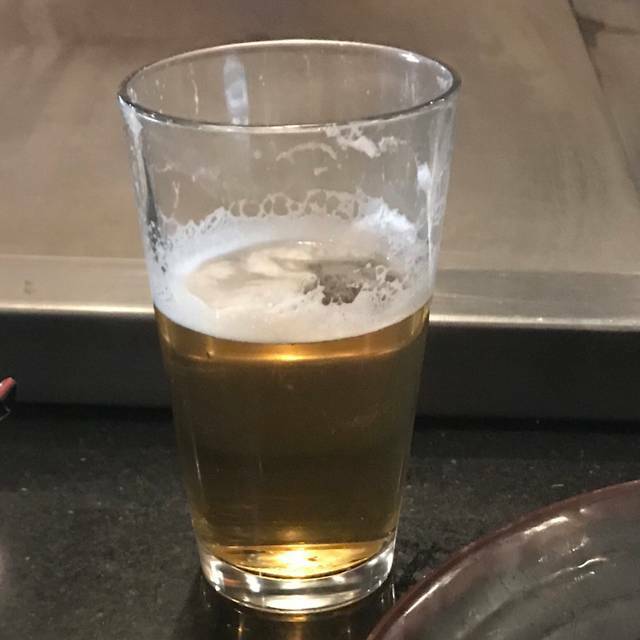 At other hibachi places, we have been able to request an entirely gluten free table. I did request that in my OpenTable reservation, and nothing at all was said about it so I figured the note... didn't make it through? Regardless, that food came before the chef started, which was a little awkward, but better than the member of our party who actually ordered from the kitchen. Four times during the meal, we literally got up from the table to find staff to figure out when he would get his food. Everyone else was finished after the third attempt, but we had been told his food would be out momentarily. None of our dishes were bussed. The manager wasn't on site, and the man we did talk to (finally) about our concerns gave us 3 gift cards worth $15 each that expire on December 30th. Each of the five members of our party ordered items that cost more than that, and the drinks that never came probably would have been only the first round. Plus-- why on Earth would we be back, much less within a couple of weeks? The expiration date was before the end of the month! It felt absolutely silly. It was my birthday, which was mentioned at the time we spoke to the man who gave us the gift certificates, and his eyes lit up and he said, "We have a birthday tonight!?" With the enthusiasm you would expect at the beginning of the dining experience. At that point we just wanted to leave. A woman from the other party at our table actually chased someone down to pay because they didn't feel like waiting at a table covered in dirty dishes with no drinks anymore. We left one member of our party behind, and he joined us again later. The service was horrible. They are sorely understaffed and the staff they have is incompetent. Almost everyone in the restaurant was complaining about the service (or lack of), the wait time for the hibachi food and the food from the kitchen, drinks were not refilled or even brought out. Never again. 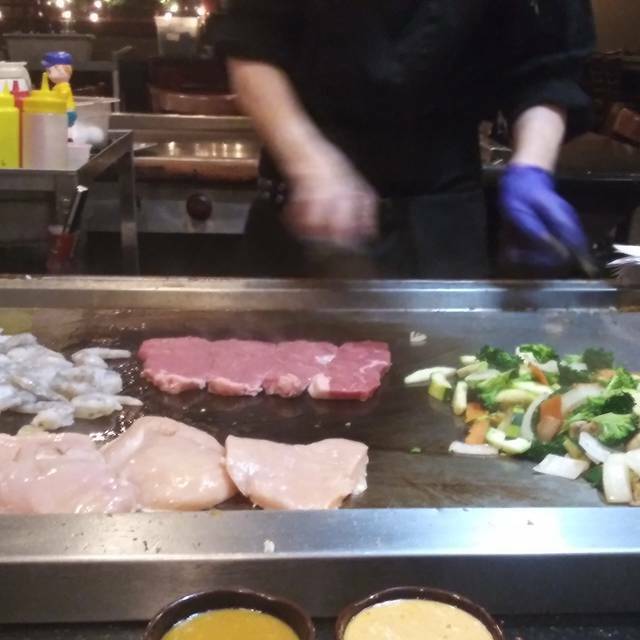 This was our first time at Wasabi Hibachi Steak House we were looking for something a little intimate without children around. It was our date night. We were trying to escape the kids! The 1st hostee was very nice and was about to sit us however a 2nd hostee appears and informed us we had to wait 30 minutes. The 1st hostee sat us anyway. Being around children appetite to eat was going. Took 30 minutes to place our order. When we ordered he asked how we wanted our steaks. We said medium. We got well done. Everything had a burnt taste. Definitely wasn’t worth $38. That’s for sure. Unfortunately this will probably be the last time we ever come here. It has been a family tradition that we all meet at Wasabi on Black Friday. Our party is normally 12-20 people. This year we had 15. When we arrived for our 7:30 reservation the place was unusually slow. Because there were only 13 of us (two of our party were running late) they refused to seat us even though the restaurant was virtually empty. It would have been much nicer to have been able to sit at the table to catch up instead of a few benches in the front where most of us had to stand. I made several pleas to allow us to sit down but they made us wait the extra 30 minutes until my cousins arrived. Bad choice as while we were there we decided to try Benihana next year.